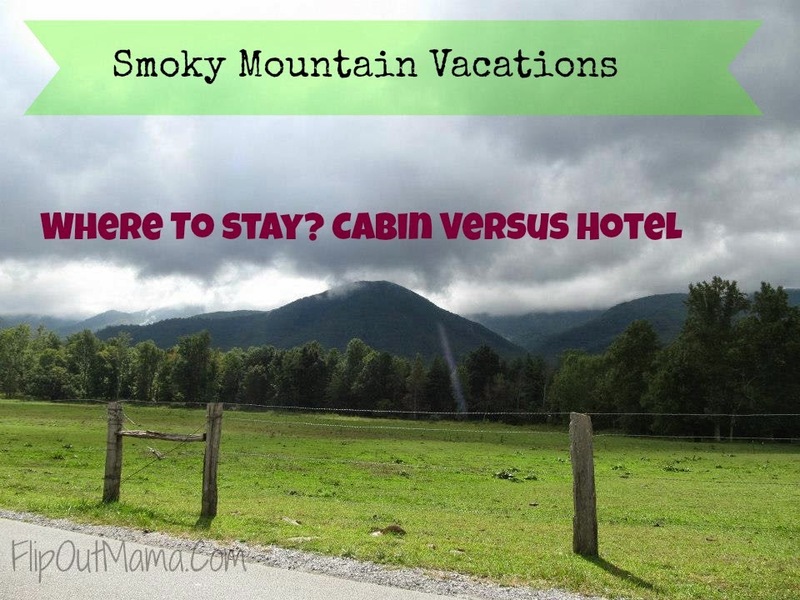 When you are planning a trip to the Smokies, one of the hardest things to decide is where to stay. If you are unfortunately like me, it is one of the biggest and most important things to plan as well. I have to first figure out the WHEN of a vacation, followed by where we will stay. I don't feel like I can really start planning properly until I have those two things figured out. That means, none of the fun stuff can be done until I figure out the WHEN and WHERE. It can be a little bit overwhelming, especially if you have never been to the area before. Let's talk about what you need to know to help you decide! If your family is like ours, it's important to make and stick to a budget before you ever leave for vacation. The good news is that when it comes to the cost, cabins and hotels are pretty comparable. Of course, you will find hotels that run at the very, very low end of the spectrum, and you can find some pretty pricey hotels and cabins as well. It all just depends on what you are looking for. I would say that on average, a cabin will run between $100-150 a night, and a hotel room is pretty close to the same. Of course, you can splurge and spend way more than this, or you can really scrimp and stay somewhere for cheap, but for the most part, the prices are close to the same. Where you want to stay is going to be a big part of where you stay. Generally speaking, cabins are located, well, in the mountains. Hotels are located in town, usually on the "strip" or very near it, and within walking distance of attractions, restaurants and shopping. If you stay in a cabin, you are most likely going to have to drive everywhere. (There are exceptions to this rule, as you can find a few cabins that are located near downtown Gatlinburg, within walking distance of the strip). Is it important to you to be near all of the excitement, or are you looking for peace and quiet? Do you want to be near the national park so you can go hiking at a moment's notice? This will help you decide which is right for you. I personally hate to drive in a busy place, and I especially hate to drive at night, so for our family, a hotel usually just works better. PRIVACY: What kind of vacation are you looking for? Is this a fun family adventure, or a romantic getaway? Is this a relax and recharge kind of thing, or a be in the middle of the action fun fest? Those answers will help you decide where to stay. If you are looking for peace, quiet, relaxation, and privacy, a cabin is definitely the choice for you. You can get a cabin where you are completely secluded, with no one anywhere around. If you choose a hotel, it's likely that you are going to have some "neighbors" through the duration of your stay, and there is no way to tell if they are going to be the quiet type or not. If you don't care about quiet or privacy, a hotel might be more your style. What, if any, amenities are important to you in your accomodations? Did you know that you can rent a cabin with it's own private indoor pool? Seriously! Hot tubs, pool tables, game rooms, exercise equipment, these are all options that you can get in your own private cabin. However, there are also some amazing amenities at the hotels in the Smokies! There are several hotels that offer complete spas, indoor or outdoor water parks, on site restaurants, and more. Decide what amenities you want/need beforehand, and your search will be much easier! How many people are tagging along on your vacation? If you have more than will fit in a standard hotel room, your costs can quickly add up if you need to upgrade to a suite or add on additional rooms. The great thing about renting a cabin is that you can find one that sleeps anywhere from 2 people up to 22 people,and everything in between! If you are having a big group event like a family reunion or wedding, it might be more sensible for you to go with a cabin. You can also cook all of your meals at a cabin, since you will have access to a full kitchen, and that can save some serious cash! For me, one of my favorite things about vacation is the "ease" of everything. I like to leave our hotel room, and walk straight to the restaurant or show that I want to attend. I like to hop right on a trolley from my hotel parking lot. I don't want to drive, I don't want to navigate, I don't want to cook. In other words, when I am on vacation, I want to do as LITTLE "Thinking" as possible. For me, a hotel is best for this, since I am in a central location that is convenient to everything. Ideally, I don't get back in my car until it's time to drive home! If driving doesn't bother you,however, a cabin might be the best choice. Keep in mind that unless you get a cabin close to downtown, you will have to drive to the grocery store, shopping, shows, restaurants and anything else that you want to do. Hopefully, this post will help you to decide whether a cabin or a hotel is right for you. We like to switch it up and stay at different places when we visit, so we always get a different experience! We wholeheartedly recommend the Econo Lodge Riverside in Pigeon Forge -we had a great experience there when we stayed for a week last Fall, it felt like home! The Music Road Inn has also been a favorite of ours in the past, they have a great atmosphere and a very family friendly atmosphere. If you are in the mood for some REAL family adventure, you can't beat Wilderness At The Smokies. Their THREE water parks and family adventure center will keep you busy and make sure that you sleep good at night! As for cabins, I would recommend Arrowhead Cabin Rentals! Do you have any favorite hotels or Smoky Mountain Cabins? Let us know in the comments below!! My husband is 6'5" and we have three kids. They are all teenagers now, but even before then it was really hard for all of us to stay in one hotel room. And renting two hotel rooms really eats into your vacation fund! We've always loved going to Pigeon Forge/Gatlinburg. We've rented through several companies, but Fireside Chalets and Cabins is the one we have used the most. I've noticed more and more rentals on VRBO.com, as well. I'm definitely going to check out Arrowhead Rentals and see if there is a price difference! One thing I can recommend is if you are staying for more than a couple of days or if you are making a return trip, buy a Dollywood season pass. There is a lot to do, so you can find something for just about any age. They generally have the "arrive after 3, the next day is free" option, but if you are staying for a while, it's worth it to get a pass. It will pay for itself with about two visits! And make sure one person gets a gold pass for free parking and discounts on food and sometimes on other attractions (although we try not to eat much in the park and we usually buy two refillable cups and share them)!! If you aren't interested in that sort of thing, plan to spend some time at Cade's Cove. There is a lot of hiking and exploring that can be done there. As far as food goes, my husband is a Huck Finn's fan and I love the AppleBarn. The kids like all the pancake houses! !